AMHERST, Mass. - No. 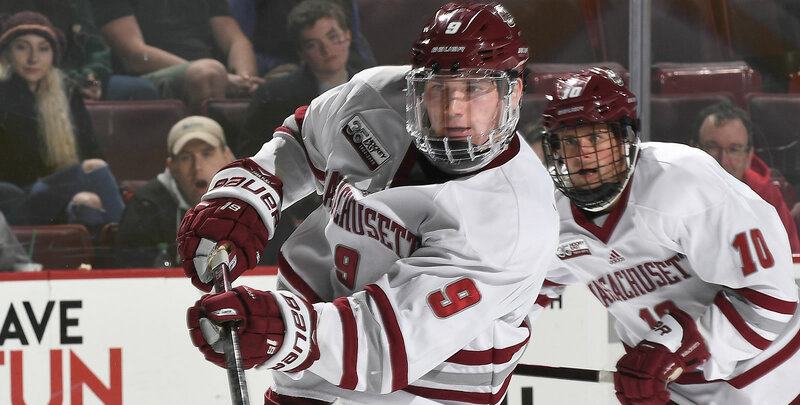 2 University of Massachusetts hockey posted a three-goal second period to erase an early deficit and skate to a 4-2 win over Boston University on Friday night in front of a sold-out crowd of 8,389 at the Mullins Center. The victory moves the Minutemen to 21-5-0 (13-3-0 HEA) tying a program record for victories set in 2006-07, while the Terriers drop to 10-13-3 overall and 8-7-2 in league action. "In the game last Friday, obviously, it's tough to win on the road but we found a way to win, said UMass head coach Greg Carvel. "But giving up five goals was not good, so our focus this week was playing better defensively and trying to limit BU's offense and I thought we did a very good job of that tonight. I never worry about our team scoring goals, I'm always more concerned about the play without the puck. I'm really happy with the way we played; it was great to get goals from two guys who haven't had goals this year in (Jack) Suter and (Jake) McLaughlin. I liked our compete, I liked our game plan. We didn't give them a lot of speed up and down the ice, although they slid a guy out of the zone a few times and caught us napping. Filip Lindberg did a good job in net, and I thought (Jake) Oettinger made a lot of big saves for them. I'm very excited to move on." BU opened the scoring 6:54 into the first period with Dante Fabbro ripping a feed from Ty Amonte and Joel Farabee past Lindberg from the left faceoff circle for a power-play goal and the lone tally of the stanza. Ten seconds following a second period time out for the Minutemen, sophomore John Leonard netted the equalizer, taking the puck from senior Jacob Pritchard and freshman Marc Del Gaizo and driving to the high slot for his 10th of the season at the 6:20 mark. Minutes later UMass took the lead on Suter's first tally of the year after sophomore Cale Makar skated the length of the ice and sent him a crisp centering pass out of the corner 8:20 into the frame. McLaughlin then expanded the advantage to 3-1 with his goal at 15:07, tucked in at the net front off a feed from Suter and senior Brett Boeing. The Minutemen added their fourth of the evening on the power play 11:56 into the third. Del Gaizo swatted home a puck at the top of the crease from Pritchard and Leonard for his 10th of the year. Shane Bowers capped the scoring with a shorthanded goal for BU in the final minute of play. UMass finished the contest with a 39-27 shot advantage and went 1-for-3 on the power play, while the Terriers were 1-for-5. Lindberg stopped 25 shots in net for the Minutemen en route to the win (5-2-0) and Oettinger turned aside 35 for BU. Del Gaizo extended his point streak to four straight games with his fifth multi-point game of the season, contributing a goal and an assist in Friday night's victory. Leonard's goal and assist gave him his 15th career multi-point game and he now has six points over the past three contests. Suter logged his first career multi-point game with a goal and an assist and Pritchard's pair of helpers pushed his point streak to six straight, his 11th multi-point game of the season. UMass will be back in action tomorrow, Feb. 9, facing No. 15 UMass Lowell at 7 p.m. at the Tsongas Center.